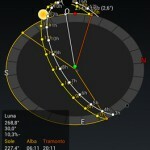 Sun Surveyor is a new mobile application able to track the position of sun and moon in real time and to predict them. It’s very useful on location and even at home to predict the position when you a have to go on a new place in a particular period of time. The main features are: 3D compass, map, AR camera, details, calibration. The application when launched shows a page with all the modalities seen in fig. 1. The first mode (fig. 2) is called 3D compass and is very useful on location, with this you can view on a plane where sun and moon are located and moving the time slider you can easily predict where you can find them at specified time and date. On the screen there are two lines that indicates where sun and moon rises and sets, very useful for all landscapes photographers or cinematographers. With the second mode (fig. 5) you have a visualization of the Google Map with sun and moon on top of that, useful to study a location in advance or better understand where you can position your camera to have a particular light condition during the day. AR camera (seen in fig. 4) is an augmented reality function that you can use on location, it uses the camera and impresses hover the elliptic of the sun, with this feature you can understand for example if the sun will set behind a mountain or a building. If it’s not on you desired location try to move the time slider and you can easily study when you could find it on the right position. Very cool! With the page details (fig. 6) you have all the informations about sunrise, sunset, blue hour, golden light with all the times for a specific place and date (you can easily change it with the two icons located at the top of the screen). Finally calibration lets adjust the gyroscopic sensors of your device to better give an accurate measure of the north. The application is available for Android and iPhone on the relative markets at the price of € 5,00, there is even a free version with limited functionalities useful to try it. Having used it for some time I have found it really useful in many situations, this is an app that can’t be missed if you are a serious landscape photographer. Be warned to give a good calibration of your compass or you can get wrong measures, however this is not a fault of the application but of the device.